A competition was held to design a coin to memorialize the end of World I and the peace that, at least temporarily, returned to the world. Italian American sculptor Anthony de Francisci's design won. This guide will give you an idea of how much your peace silver dollars, minted from 1921 to 1935, are worth. The table below provides average coin values and prices based upon the condition of the coin. 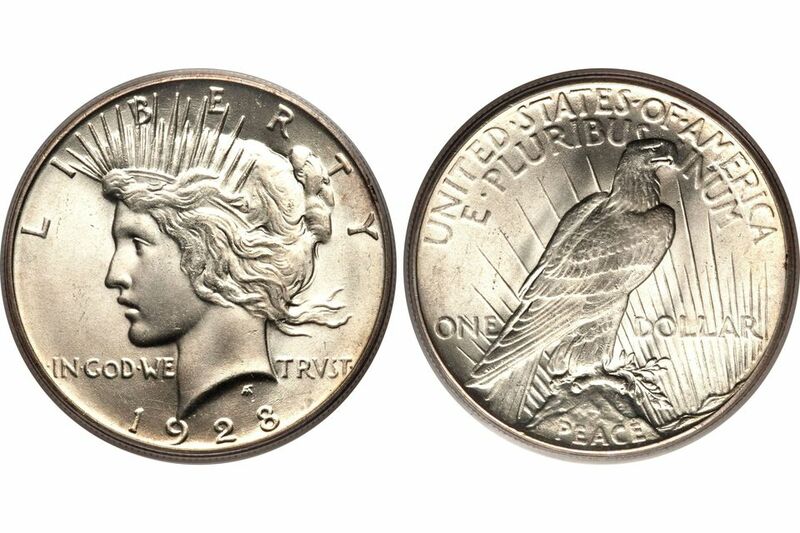 In 1920 America was celebrating the recent end to World War I and Farran Zerbe, historian of the American Numismatic Association, presented a paper entitled, "Commemorate the Peace with a Coin for Circulation," proposing a new design for the half dollar or the silver dollar if the denomination gets resurrected. The enthusiasm for this idea was so great that the ANA created a committee to help prepare a bill for Congress to accomplish this task. In November 1921 the Federal Commission of Fine Arts announced a competition for a design to commemorate the world peace after the war. The Treasury Department and The Mint ultimately chose De Francisci's design in the early part of December 1921. With the competition ending this late in the year, it did not leave much time for production of silver dollars dated 1921. From December 26 through 31, 1921 a total of 1,006,473 peace dollars were struck at the Philadelphia mint. The initial design was in high relief to accentuate the artistic details of this new silver dollar. Unfortunately, it was difficult to strike, and in 1922 the relief was lowered to make it easier to mint them. Well worn Peace Dollars derive a majority of their value from the silver content of the coin. Therefore, if the price of silver is relatively high, the coin will be worth only what it's silver content is. Peace silver dollars were a relatively short series of US coins to collect, and therefore there is usually a pretty good demand for them. If you want to get paid top-dollar for your Peace Dollars, you need to sort and organize your coins so the coin dealer can quickly see what you have. As with all coins, certain dates and rarities will cause some coins to be worth more than others. The following peace silver dollars in any condition, are worth considerable more than common ones. As such, these key dates, rarities, and varieties for Peace silver dollars are sometimes counterfeit or altered from common examples. Therefore, before you start celebrating your early retirement with your new found wealth, have the coin authenticated by a reputable coin dealer or third party grading service. Be sure to use a good light and low-level magnification when you are grading Peace silver dollars. These large silver dollars tend to have a lot of bag marks and scrapes just while they were being handled at the mint facility. As illustrated in the photo in the link below, the mint mark is located on the reverse of the coin, just below the word "ONE" on the left side. The following table has the buy prices of what you can expect to pay to a dealer to purchase the coin and sell values of what you can expect a dealer to pay you if you sell the coin. Average circulated Peace silver dollars are sometimes traded more for their bullion value than their numismatic price. These are approximate retail prices and wholesale values. The actual offer you receive from a particular coin dealer will vary depending on the actual grade of the coin and some other factors that determine its worth. *= See the section above "Key Dates, Rarities and Varieties" for more information on these coins. How Much Is My Mercury or Winged Liberty Head Dime Worth?